The offices of VLIZ – and the other institutions located at the InnovOcean site – are housed in the former warehouses of the Ostend fish market. The buildings are situated on the east bank of the harbour and overlook the harbour channel and the centre of Ostend. 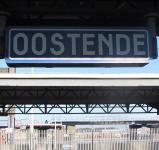 The Ostend railway station is located in the city centre, within walking distance of the promenade and the shopping streets. There is a direct connection to and from Kortrijk, Ghent, Brussels and Antwerp. For international trips there is a direct connection with Lille and a connection with Paris operated by Thalys (by way of Brussels). 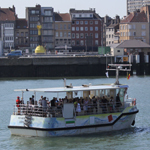 Pedestrians and cyclists can take the free ferry from the centre of Ostend (Visserskaai) to the VLIZ offices located on the other side of the harbour channel. To reach the ferry from the Ostend railway station, turn right, cross the bridge and turn right again at Visserskaai towards the ferry bridge near the North Sea Aquarium. 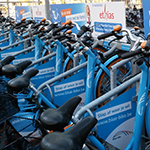 A blue-bike station can be found at the Oostende railway station where you have a bike available as a member with a membership card. Thanks to the handy locker, you can comfortably park your blue-bike everywhere and you can keep it for 18 hours. When you take the train back, just drop the blue-bike at the station again. 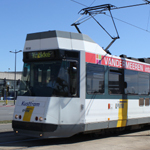 When leaving the Ostend railway station, take the coastal tram in the direction of Knokke up to the ‘Weg naar vismijn’ tram stop. At the end of Vismijnlaan you walk by the waterside on the left side of the indoor fish market. The main entrance of VLIZ is located at the end of the InnovOcean site in warehouse 48. This is about a 10 minute walk. 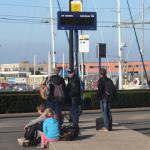 Go to bus platform 5 in front of the railway station and take bus route 9 (Sas Slijkens via Groenendijk). Get off at the 'Sluisplein' bus stop. Cross Moreauxlaan and proceed towards Vismijnlaan. Drive towards Gent (Ghent), then towards Brugge (Bruges) (E40) and finally towards Oostende (Ostend) (E40/A10). Drive towards Kortrijk (Courtrai), then towards Brugge (Bruges) (E17) and finally towards Oostende (Ostend) (E40/A10). - If you take the Channel Tunnel or the ferry to Calais or Dunkirk (Dunkerque): drive towards Bruges (Brugge) – Ostend (Oostende) – Brussels (Bruxelles/Brussel) (A16/E40); at Jabbeke take the turning to Ostend (Oostende) (A10 – turning 6). Be sure not to take the first exit towards Ostend (exit 5 in Gistel), otherwise you will end up in the centre of Ostend. - If you take the ferry to Zeebrugge: follow the N34 to Ostend. 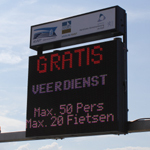 At the end of the E40/A10 motorway you enter Ostend and take exit 4 towards Blankenberge (N34). 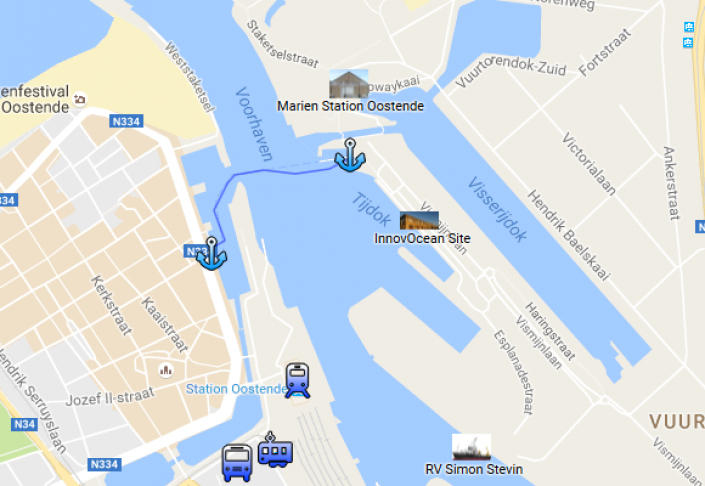 When you have passed the traffic lights, a roundabout, a viaduct and the blue bridges, turn left at the fourth traffic light (follow the sign ‘VLIZ – InnovOcean site’ ). Mind the tram! After crossing the tram line, immediately turn right and then take the first street on the left (Nieuwewerfkaai). At the end of the road turn right (Vismijnlaan). At the bottom of Vismijnlaan – just in front of the passageway through the fish market – take Wandelaarkaai on your left. Ample parking facilities are provided by the waterside. On the lower floor of Brussels Airport, take the train to Brussels-Midi/Zuid (frequency: every 20 min.). Then take the hourly direct train to Ostend (1 hour 42 minutes) or you can transfer in Brugge (Bruges) to go to Ostend (1 hour 47 minutes). At the airport it is also possible to take the train to Gent (Ghent) – St.-Pieters and rail to Ostend from there (2 hours 19 minutes).